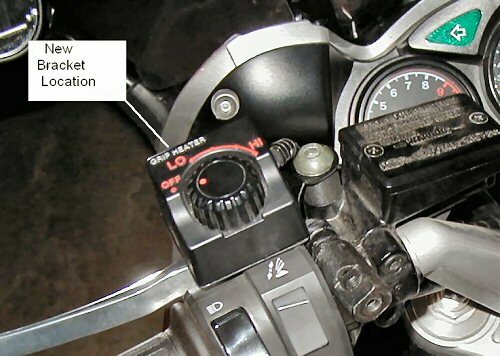 Would you like to move your Yamaha FJR1300 heated grips controller mount to the left and have it located behind the left hand control cluster instead of on top of the left brake cylinder? You can do this pretty easily and can lower the control so it's right behind the control cluster instead of sitting "perched" on top of the brake master cylinder. All that is required is some thin sheet metal, a little cutting, drilling and bending, and a coat of paint to protect the new bracket. 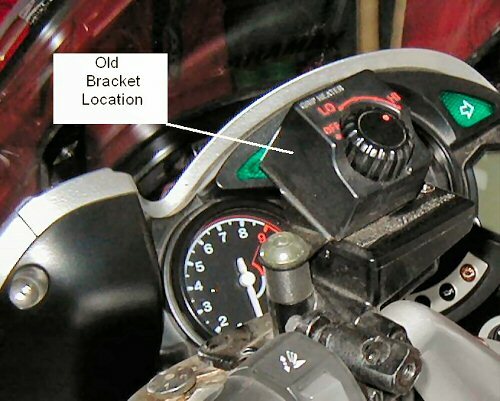 Here's how the standard Yamaha heat controller mounting bracket looks (see photo above). And the above photo shows how the heat controller looks with the new bracket. If this looks good, read on - it's pretty easy to make the modifications. 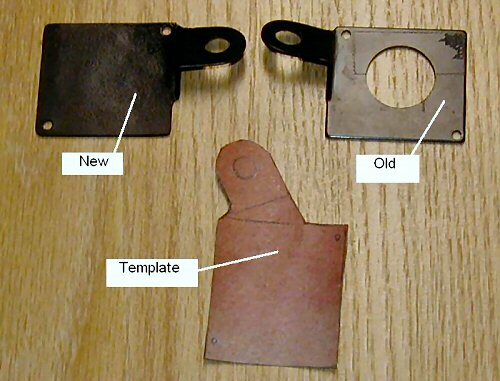 The picture above shows the original bracket, a paper template, and the new sheet metal cutout. The same cutout as the orignial bracket is used. The only difference is a reversal of the bends that position the bracket. If you are a risk taker and have a vise handy, you can just re-bend your original bracket and repaint it. I chose to make a new one. Above is a picture of the painted new bracket alongside the old bracket. They are the same shape, just reverse bends for the mounting tab. The custom bending rig is just a benchtop vise. Make sure you have the original bracket nearby to ensure that you are bending it in the reverse direction (no sense making another duplicate bracket). A little paint to cover up the bare metal (I used RustOleum textured black) and you are ready to reinstall the bracket on the bike. 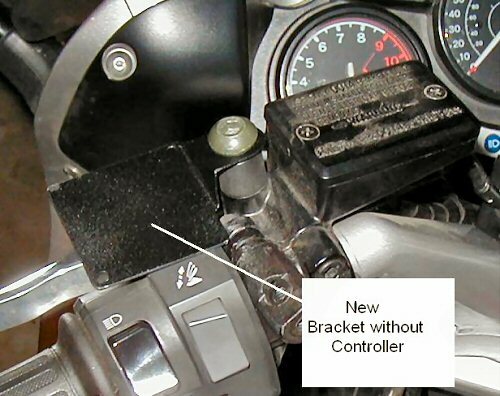 Here's the final picture of the new bracket on the bike, without the controller. The forward tilt of the controller is still maintained to make sure that rain doesn't get down inside the controller. The cables have plenty of length and all that I had to do was to cut one of the cable ties, reposition the cables, and install a new cable tie. Total time, not counting time to let the paint dry was less than one hour. Copyright © 2004, by Brian Horais and H. Marc Lewis.